Of all the botanical oddities to be found in Colombia, Frailejones are probably one of the most striking. 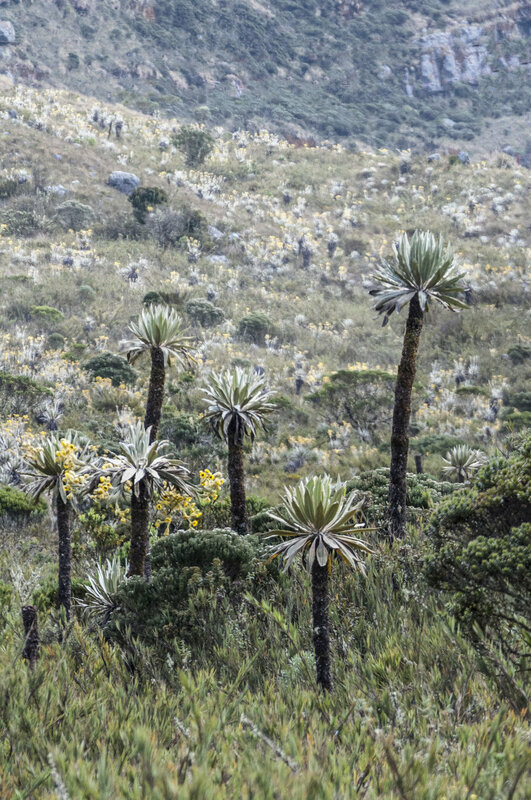 Their distinctive shape is unmistakable and their image is iconic of the páramo ecosystem. Frailejones grow above the tree line, usually starting at about 7,500'/2,300 m, up to nearly 15,000' /4,600 m above sea level. They dominate the windswept plains of the Colombian Andes, and also occur in similar habitats in Venezuela, Ecuador, Perú and Brazil. Of an estimated 135 species, 126 grow in Colombia, Venezuela and Ecuador. All members of the genus are handsome, open rosetted plants that carry a thick head of pubescent silver leaves. Most species develop a stem, and their size ranges, in fully adult plants, from about three feet (~one meter) (e.g. E. grandiflora) to a little over 60'/18.5 m (E.uribei). While a few species can grow in milder climate, they are all heat sensitive and none will grow where night-time temperatures exceed 68 F/20C. Frailejones produce a variable number of axillary flower stalks, which in most cases carry from 10 – 200 flowers each. The flowers look like plush sunflowers and are attended by typical páramo pollinators: beetles and bumblebees. Any insect less robust would be blown away by the strong winds that perpetually buffet this landscape. Frailejones are well adapted to these climatic conditions. In many páramo areas they form solid colonies that can stretch for many square miles/kilometers. There are not many other plants that are as successful as espeletias under these condition, except potatoes, the main crop of the Colombian highlands. Landowners with property in these upland areas theoretically face the dilemma of either preserving their páramo properties as private nature reserves and go broke, or burning the páramo and planting potatoes for profit. For most of them, this is not much of a dilemma. Based on these threats, all species of Espeletia are considered, if not technically endangered, at least vulnerable or threatened. While there are still large populations of a few species, others are quite scarce. 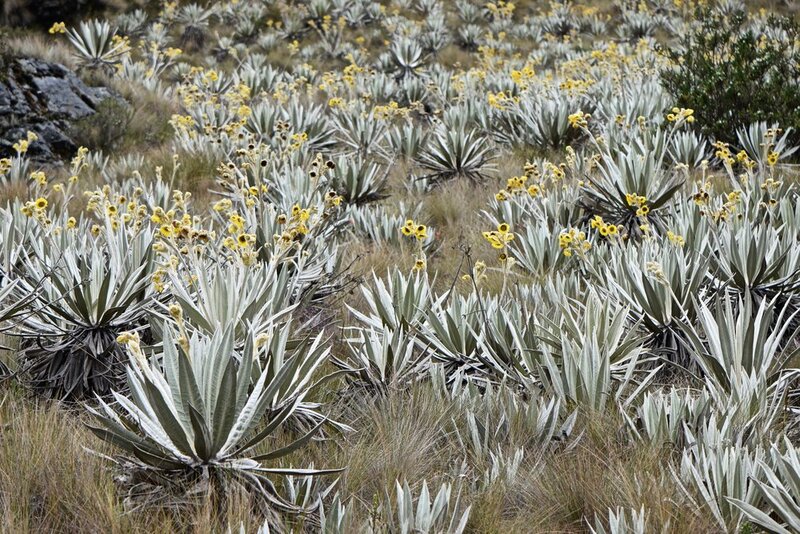 There is a lot of advertising in Colombia involving awareness about these plants and the importance of páramo conservation. But the country is fast losing its oldest "Big Friars" to fires, tractors, 4WD rallies, construction, mining and agriculture. While there is a lot of information available on the botany, distribution and conservation needs of these plants, there is very little on their horticulture. On the other hand, they are sunflowers. How hard can it be to produce them? “They can't be cultivated", was the usual answer I received when I asked whether someone was growing these plants. After several frustrating conversations with Colombian biologists and botanists, I was told that the local botanical garden had implemented a project to grow Espeletia species and other threatened páramo plants. The next day I visited them and was directed to an elevated trial plot in the middle of their facilities. The páramo here can be much like a highland bog, or at least it looks like one, just much more diverse. The ground is covered by a thick carpet of mosses and every luxurious landscape detail looks like a fractal of a Japanese garden. Each rock, nook and cranny has miniature orchids, wild blueberries and mock heathers, as well as epiphytic and terrestrial ferns growing in wild profusion. Dwarf bamboo borders creeks and ponds. At the edge of the plains the color changes to blueish-green, where Andean forests border the highlands and fill the valleys below. It is a vast sponge, filled with water. And rather good water it is, too! Espeletia, like many other Asteraceae, have a typical mass reproductive strategy. They produce enormous amounts of small seeds that are mainly wind-dispersed. The flowers last about two months, after which they dry out and drop. To test how challenging it would be to grow them from seed, I visited a friend who owns property with patches of four species of Frailejones. I took four labeled Ziploc bags and collected seed by holding groups of three to four dry flowers inside the bag and shaking them for a minute. I figured that most of the good seed would have already been dispersed by wind and insects while the seed heads were still fresh but dried. What I was collecting were remnant seeds that stood a very slim chance of survival in nature. Considering the conditions where these plants originate, I decided to try to grow them like Alpine Nepenthes spp. from seed. I used high quality, long-fiber sphagnum moss mixed with reverse osmosis-source (RO) water and sterilized it in the microwave for 10 minutes. Once it cooled down, I pressed the excess water out and filled the cells of a germination tray to a ~1"/3-cm deep layer. Seeds were cleaned with RO water and planted with tweezers in these trays with about three to four seeds inserted per cell. The germination tray was prepared as described before and was fitted inside a plastic box and sealed with Saran Wrap. The box was placed in a spot where it got lots of light, but no direct sunlight. In other words, it was more or less left in the garage for a couple of months. This approach, which I like to call horticulture by neglect, occasionally yields fantastic results. After three months, I removed the plastic wrap and was rather surprised to find an excellent ~90% germination rate. All cells had two to four young plants, approximately 1.25"/3-4 centimeters across. There were no weeds, algae or mosses growing on the substrate, so I sprayed the plantlets with a little more RO water, then resealed the box with plastic wrap. Over the next year, I prepared four more boxes in the same manner, mostly working with E. grandiflora. Germination rates were invariably ~90% and after about eight months the plants had to be moved to individual pots since they were starting to crowd each other. At least for this first phase, there seemed to be no mysteries for their propagation. Hardening, however, turned out to be a totally different ballgame. I transplanted individual plants into plastic 4”/10 cm pots using three substrates: pure sphagnum, sphagnum mixed with pumice and sphagnum + pumice + leaf litter. All pots were placed in plastic boxes and again sealed with plastic wrap. After six weeks, all plants had grown about another 1"/2.5 cm in diameter and the ones in pure sphagnum looked best. I took these pots out of the box and placed them on a windowsill, each pot in a tray of water. My experience showed that as long as the sphagnum doesn't dry out the plants do great. The first weekend of sunshine (in what's humorously called summer in Bogotá), I lost several plants. They will dehydrate incredibly quickly when exposed. I then placed half a transparent soft drink bottle over each surviving plant and they thrived. Bogotá has a relatively low ambient humidity (65%) compared to páramo (110%). This difference is more than enough to lose cultivated plants. Water quality appears critical to success. The plants that were sprouted and watered with RO water reached about a foot/25-30 cm across in a little less than two years. I have since given away over 200 plants. Those who were planted in cool areas of high humidity are still thriving and are now over 20"/50 cm across. In their fourth year they still haven´t developed a stem, but they should probably start to elevate next year. I estimate that under greenhouse conditions in situ, one should be able to produce similar size plants in three years, ready for transplant. Local lore says that espeletias grow less than 0.5"/1 cm/ year in nature, that is to say that they add less than 0.5"/1 cm/year in overall stem height. While that sounds initially plausible and romantic, it is more than a little doubtful that a 60'+/~20 meter stem on a sunflower that grows in what is often a very hostile environment is actually ~2,000 years old. Having said that. They might grow well in parts of the San Francisco Bay Area in California and other places with cool and humid weather in the summer and plentiful cold rainfall in winter. The grow perfectly at as low as 3,250'/1,000 m in some regions of Colombia and elsewhere in the Andean countries and they can take a mild winter, but they are quite intolerant of dry air and/or poor water quality. Again, they excel with RO/pure rainwater and while they will also do well with purified drinking water, you will definitely notice the difference when they are grown with the former. As mentioned above, I still have a few plants at home, pampered and doing quite well. As long as they have access to excellent water, lots of light and high ambient humidity, they are relatively easy to grow here. They can be fertilized with Osmocote or other balanced, controlled-release fertilizers. They also respond very well to supplemental feeding with algae/seaweed extracts. Sadly, I doubt that they will ever become a popular "captive" landscape plant anywhere, even where they are common. They would, however, make handsome additions to integrated Neotropical hedgerow plantings and páramo flora restoration projects where they are indigenous, combined with sympatric Tibouchina spp., Bejaria spp., Cavendishia spp. and other striking Andean highland plants.